Now that Connor McDavid has played nine games this season, the Edmonton Oilers will have to decide whether he plays No. 10 and burns a year on his entry-level contract. Uh, never mind on that one. This admittedly lame attempt at humour does underline two things, though. One, McDavid, unbelievably, is still eligible to play for the Erie Otters of the Ontario Hockey League, which is hilarious given that the 19-year-old leads the NHL in scoring. Two, the old nine-game/10-game do-we-burn-a-year-of-the-entry-level-contract dilemma is upon teams throughout the NHL. In some instances, the decision is so patently obvious that it's no decision at all. Like in Philadelphia, where rookie forward Travis Konecny and rookie defenceman Ivan Provorov each played their 10th game Sunday night. That means, even if they were to subsequently be sent back to their respective junior teams this season - the OHL's Sarnia Sting for Konecny and the Western League's Brandon Wheat Kings for Provorov - the first year of their entry-level contracts would be burned or effectively used up. Flyers general manager Ron Hextall, by the way, made it clear from day one that Konecny and Provorov would be with the Flyers for the entire season. The players have justified that faith in the early going. Konecny has one goal and seven points, averaging 15:28 of ice time in becoming an integral part of the team. Provorov has been a little more erratic, posting a minus-eight ranking and five assists while averaging 20:02, but has on some nights been the Flyers most impressive defenceman while logging big minutes. The Montreal Canadiens, meanwhile, decided Monday to return defenceman Mikhail Sergachev to the Windsor Spitfires. No surprise, really. Sergachev had played only three games, averaging 10:25 with no points. TSN Hockey insider Bob McKenzie joins the morning show to discuss the Habs' depth, Shea Weber's impact, the NHL's lack of UFA appeal and the goaltending issue in Tampa Bay. The truth is fewer and fewer teams are worrying about the nine-game/10-game decision and are much more cognizant and careful about the 39-game/40-game threshold. In some cases there are actually financial benefits to burning the first year of a player's entry-level contract, but once a player is on the NHL roster for the club's first 40 games, that counts as a year's service toward free agency. Seven years of service currently gets an NHL player to unrestricted free agency — either that or age 27 — so if an underage player in the NHL were returned to his junior club after the team's 39th game but before the 40th, this season wouldn't count toward the player's seven-year UFA meter. - The Arizona Coyotes have a trio of underage juniors — defenceman Jakob Chychrun, centre Dylan Strome and winger Lawson Crouse — and all options remain open on all three. Many feel it would be a surprise if Chychrun, who has played seven games while averaging 16:19 and scoring one goal and three points (plus-two ranking), were to be returned to junior, but the Coyotes have yet to make a commitment to keeping him in the NHL this season. For now, the mantra in Arizona is to do what is best for each individual player’s development, so the door at least remains open to that possibility not only for Chychrun but Crouse and perhaps Strome, too. But there is also a strong sense that Strome, in particular, would not be served well returning to Erie of the OHL. He's only played in three games with the Coyotes, averaging 15:49 with no points and a minus-three ranking. But the third overall pick in 2015 dominated junior last season and the belief is another OHL year would not serve him well; that what he needs to do to improve — get physically stronger, play the game with a little more pace — is best served by practising, training and playing with NHLers. Crouse has the physical tools and speed to play the NHL game now; it's just a matter of the Coyotes deciding where they think he's best suited to get better. Crouse has played in five games, averaging 8:17 and no points with a minus-three ranking. 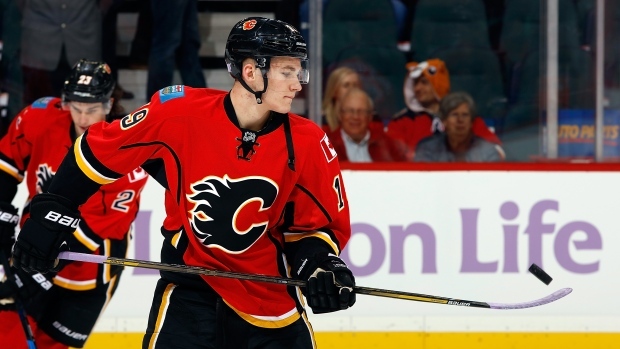 - The Calgary Flames' decision on winger Matthew Tkachuk is an interesting call. For now, both options — sending him back to the London Knights of the OHL or keeping him in Calgary — remain viable and a decision doesn't have to be made until Tkachuk plays another game. He's currently at eight games played, averaging 11:42 and posting one goal, three points and a plus-three ranking. The sense seems to be he's a strong candidate to get by the nine-game threshold, though that decision apparently hasn't been made yet. Tkachuk may well be a player where 39/40 is more important than nine/10. - The New Jersey Devils have liked what they've seen from forward Pavel Zacha, who has averaged ice time of 14:38 in eight games played, with no goals and three assists. The prevailing sentiment in New Jersey, though a final decision has not yet been made, is that Zacha is more likely to play 10 games than be returned to the Sarnia Sting of the OHL. - The New York Islanders have two very different situations on their hands with their underage juniors. Anthony Beauvillier has been tremendous, playing eight games, averaging 11:23 with one goal, five points and a plus-five rating. There is every reason to believe, based on how well he's played, that he'll fly by the 10-game mark and won't be going back to Shawinigan of the Quebec League any time soon, if at all. Teammate and fellow 2015 first rounder Matthew Barzal, on the other hand, has played in only two games, averaging 9:45 and no points and a minus-two ranking. Conventional wisdom, given the Isles' relative depth at the centre position, is that Barzal is more likely to be returned to Seattle in the WHL but the party line out of Brooklyn is no thought has been given to that...yet. With only two games in the books, the Isles don't absolutely have to make that decision, so they likely won't, for a while anyway. - The Ottawa Senators haven't played defenceman Thomas Chabot much — just 7:09 of action in one game played and no points with a minus-two rating — but we shouldn't necessarily assume that means he's on the verge of being returned to Saint John of the QMJHL. The Sens view Chabot as their seventh-best defenceman and have been keeping him around for a couple of reasons. One, because, for now anyway, he is benefitting from practising and training with NHLers. Two, because if one of their top six defencemen were to get injured or struggle, he's the organization's next best option. But the Sens also know the longer he goes without seeing game action, it can be a liability to his development. So Sens' management is likely to be more finely tuned to that situation in the next week or two, with the thought being he may ultimately end up back in junior. Mind you, one injury on the Sens' blueline could change all of that in a hurry. TSN Hockey Insider Bob McKenzie joins Leafs Lunch to discuss the Leafs dropping both games in the back-to-back and growing pains that come with a young team, as well as the emotional night for Craig Anderson and the Senators in Edmonton. - The Toronto Maple Leafs will spend no more time worrying about Mitch Marner's nine-game/10-game status than the Flyers did with Konecny and Provorov. Marner is an NHL player now who has clearly outgrown junior hockey. Marner has played nine games, averaging 16:47, with one goal, six points and a minus-two mark. Auston Matthews is still junior aged, but the first pick in the 2016 draft, of course, is going nowhere. The same can be said for 2016 No. 2 overall selection Patrik Laine in Winnipeg. Edmonton isn't overly concerned about Jesse Puljujarvi's status — he has played seven games, 11:46, one goal and two points — as he likely falls into that category of 39/40 being much more important than nine/10. Besides, Puljujarvi, as well as the rest of the underage juniors in the NHL not mentioned above, are eligible to be sent to the AHL. In other words, whether it's Sebastian Aho in Carolina, Mikko Rantanen in Colorado, Zach Werenski in Columbus or Joel Eriksson Ek in Minnesota, those junior-aged NHLers can be sent down to the AHL or recalled at any point during the season. Hard decisions with no access to the player if demoted are non-issues for these players. For now, all of them are NHLers and some of them, notably Werenski in Columbus, are really excelling. Werenski's numbers with the Blue Jackets are about as good as it gets for a 19-year-old defenceman in the NHL. He's played seven games, averaging 21:53, with two goals and six points. The London Knights own his OHL rights and he's eligible to be sent there as well as the AHL, but the reality is he's not going to be anywhere but the NHL, based on his start to the season.